PRF is a blood fraction rich in platelets and leukocytes, it represents the second generation of growth factor sources. The PRF is obtained by centrifuging the patient’s blood in the tubes without additives. PRF is pure and the final product contains exclusively fibrin obtained from the patient’s blood. The blood platelets found in the PRF are rich in growth factors. During activation, growth factors emerge from the blood platelets (platelets) and stimulate, first and foremost, angiogenesis, i.e. the creation of new blood vessels, and the growth of new bone in bone defects. As a result, the defect is better bled, which improves regeneration. Growth factors also stimulate bone growth in the defect when it comes to periodontal surgery, which additionally contribute to a better effect of the therapy itself. • When removing teeth – PRF is inserted into defect to reduce bone loss. PRF is a safe method because only part of the patient’s personal blood returns to the defect without any other add-on. PRF is an abbreviation for the term “platelet-rich fibrin”, which in translation means “platelet-rich fibrin”. These are products that come from the patient’s blood and are used primarily in oral and aesthetic surgery. In recent times, in advanced dental procedures, Fibrin is used for better healing of bones and soft tissues, and serves as an ideal preparation for surgical procedures that precede implants. We believe that you have met more than once with the fact that we can best help ourselves. Our body has a natural self-healing ability. The PRF method, through the attraction of stem cells from the body, is replenishing new tissues. The process begins by taking the blood of the patient, which is further separated by further processing through coagulation with a centrifuge in the foreseen order. What’s interesting is that the process is really fast (12 minutes) painless and simple. 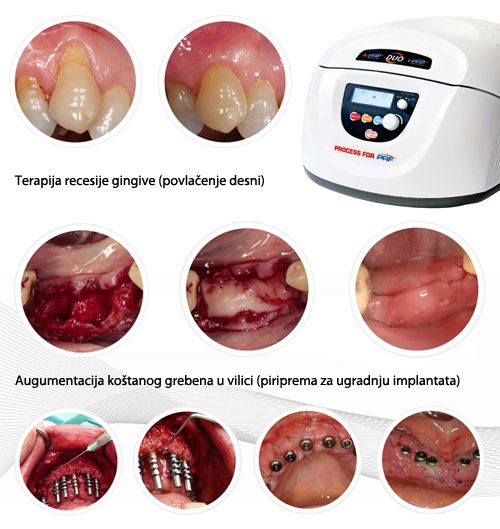 By extracting blood from red blood cells we get plasma and fibrin, which we later use as a biological autotransplant, ie, after tooth extraction, we place fibrin and plasma on the same site, which serves us to accelerate the healing process, and accelerates the process of implant recognition, and the process of embalming is making it quicker and safer, and more painless. PRF is a clean and end product, it contains exclusively fibrin and plasma obtained from the patient’s blood. When activated, growth factors emerge from the blood platelets (platelets) and stimulate first of all angiogenesis, i.e. the creation of new blood vessels and hence the growth of new bone in bone defects. The consequences of this are better nutrition of tissue with oxygen, which improves regeneration. PRF is a completely harmless method because it uses exclusively patient blood without any other supplement. The results are really exceptional.